I want to begin this week commenting on a few notable items that have been in this week’s news. Recently the media have reported extensively on the arrest of the deputy consul general of India in New York, Devyani Khobragade. The case interested me very much because, in the 20 years that I was in Washington, D.C. working with immigrants, a great deal of my time was spent working with workers — almost always women — employed as domestics by diplomats and representatives to international organizations. I want to begin by saying how sorry I am that Ms. Khobragade was subjected to humiliating treatment during her arrest. However, my concern is that with the controversy that has been generated over the method of her arrest, an important issue has been overshadowed: the protection of the worker she is accused of exploiting. I worry that the State Department and law enforcement may retreat from dealing with the very real instances of injustice that take place. In the two decades that I was in Washington, it was almost a weekly event that we would face problems with employees of diplomats and members of international organizations. Many of the workers would be economically or sexually exploited; their passports would be confiscated by their employers; and they would be brutalized and threatened. When we would turn to the State Department for help, we would routinely be told that the employers had diplomatic immunity and, if any action was taken, there would be reprisals against American diplomats in the country from which these diplomats hailed. The only concession that I was able to get was a grace period that allowed workers more time to change employers. Prior to that, if someone fled the employ of an abusive diplomat, they would immediately be in violation of their visa. The diplomats would then simply call the Immigration Service and have them hunted down. I used to say they were making our Immigration Service the slave catchers for the diplomatic corps. The grace period helped to alleviate the problem, but the fact remained that employers routinely confiscated the passports of workers to keep them from changing jobs, and that often they were underpaid or not paid at all. I still recall the case of one woman who was brought to work for the personnel director of an international organization in Washington. She came with the diplomat’s family from her home country in Latin America, ostensibly to serve as an au pair. In actuality, however, in addition to taking care of the children, she did all the household’s cooking, cleaning, landscaping, and even had to polish the man’s shoes. She worked from early morning to late at night seven days a week. After working in this way for several years, all she had to show for it was a pile of receipts they gave her each month informing her how much they were charging her for her room, board, transportation — and even toothpaste. So, I was very pleased to see that someone in law enforcement is, at last, beginning to look at the need to enforce our labor laws for employees of diplomats. I hope that, because of what seems to have been mistakes made in the way her arrest was handled, this will not result in law enforcement or the State Department backing away from policing these situations in which so many women working for diplomats and members of international organizations are truly exploited and unjustly treated. Earlier this week, we announced that, to date, nearly $820,000 has been raised through the special collection taken up in November for those affected by Typhoon Haiyan. 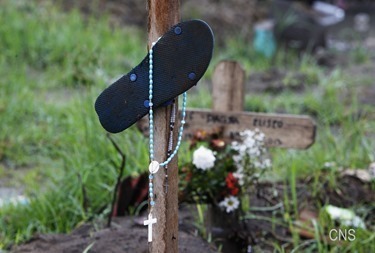 We want to express our thanks to the people of the archdiocese for their generous support of the typhoon victims. We encourage everyone to continue to keep them in their prayers, even now as the story has mostly passed from the headlines. Their suffering and their needs are still very great. We also learned this week that the Holy Father will be visiting the Holy Land in May. 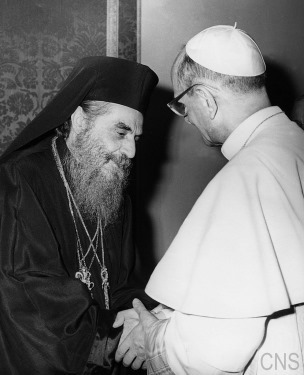 He will be recalling the pilgrimage made by Pope Paul VI and Ecumenical Patriarch Athenagoras 50 years ago. This will be a very important ecumenical moment for the Catholic and Orthodox churches. We pray for the success of the meeting and hope that it furthers the effort to build unity between our two churches. 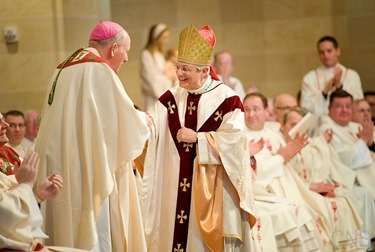 Friday, January 3 was the installation of the new Bishop of Rochester, Bishop Salvatore Matano, who as Bishop of Vermont, was formerly of the Boston Province. I had planned on attending, however, like many others that weekend, I ended up stranded in an airport waiting for a connecting flight. 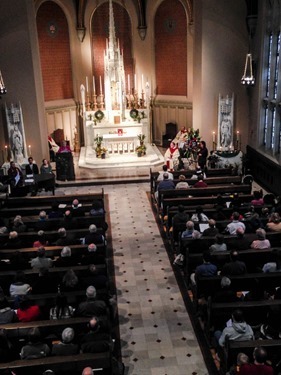 So, though I was ultimately not able to make it to the installation, I was very pleased that a number of people from Boston, including our Vicar General, Bishop Robert Deeley, and my priest secretary Father Jonathan Gaspar were able to make it by driving. 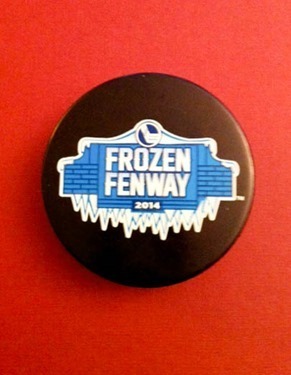 Last weekend the “Frozen Fenway” program hosted Boston College, Notre Dame, Merrimack College and Providence College for a hockey tournament. 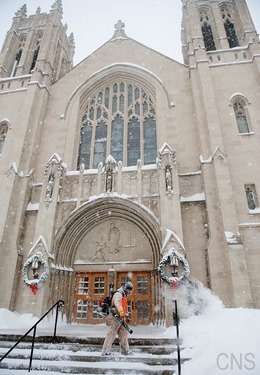 The activities surrounding the tournament included a Saturday afternoon Mass at Emmanuel College for visitors from the colleges attending the games. It had been my intention to celebrate the Mass, but a delay in my return flight led to my arriving at the end of the Mass. Thankfully I was in time to greet everyone and to express my gratitude to Sister Janet Eisner, President of Emmanuel College, for hosting the Mass and reception and to Father William Leahy for kindly stepping in as the principal celebrant and homilist on very short notice and for Boston College having organized this event. 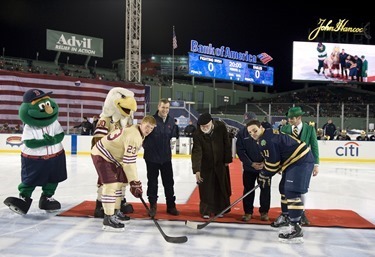 Later that evening, at the invitation of Joseph Bertagna, Commissioner of Hockey East, I participated in the ceremonial puck drop at the start of the Boston College-Notre Dame game. It was quite an experience to be out on the Fenway Park field that had been converted to a hockey rink and, thanks to the padding on the ice, I did not slip in my sandals! The Red Sox organization and Hockey East were very hospitable. 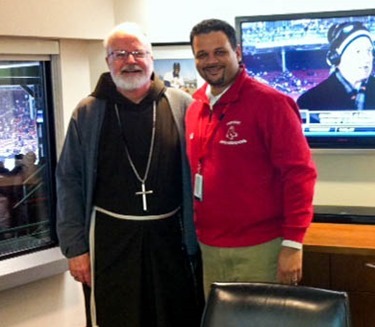 Sam Kennedy, the Red Sox Chief Operating Officer, oversaw all the arrangements and accompanied Mr. Bertagna and I to the puck drop, and Red Sox Ambassador Frankie Gonzalez was an extremely kind host during the visit. There was great enthusiasm for the game and the teams looked terrific. I think everyone was especially taken by the golden helmets of the Notre Dame team – they looked like gladiators! Although the puck drop was on behalf of both teams, at the final score Boston College prevailed. Congratulations to them. 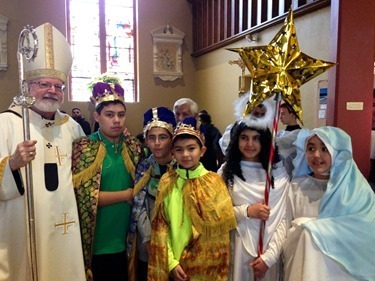 Sunday afternoon, I visited St. Mary’s in Waltham to join their Epiphany celebration of the Three Kings. I celebrated the Mass and afterwards there was a pageant in the parish hall. 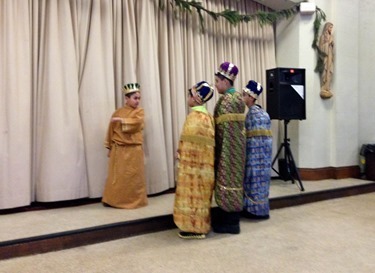 The children performed a play in which they acted out the whole visit of the Magi. 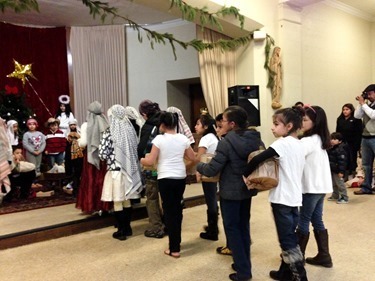 Also, towards the end very large group of children dressed as shepherds came in bringing gifts for the Christ child and singing “The Little Drummer Boy” with all the little boys and girls playing drums. 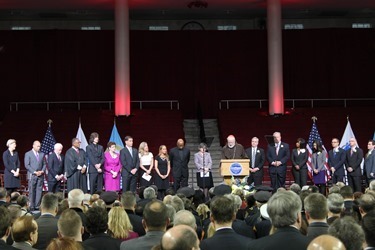 On Monday, I delivered the opening prayer at the inauguration of Boston’s new mayor, Marty Walsh, at the Conte Forum at Boston College. The diversity of the city was certainly represented at the gathering and I would say there was an atmosphere of hope in the air. Of course, there were a number of different speakers. One message that particularly struck me was the remarks by Rev. Ray Hammond. He told the people that we have to work together and that the faith community will try to cooperate, as we always have, in furthering the interests of the community. Where we can work with the government, we certainly will. Another aspect of the ceremony that was very interesting for me was seeing former Ambassador to the Vatican and former Boston Mayor Ray Flynn and his family there; along with Barry Hynes, whose father had been mayor; and relatives of Mayor Kevin White. It made me think how fortunate Boston has been to have a long history of mayors who have been good leaders and honest men who have worked for the betterment of the city. Other cities have not had the same experience. 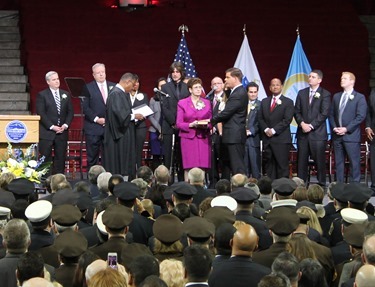 We wish Mayor Walsh well as he begins his time in office. We pray that the Lord will help him to be a good leader and help him to be able to unite people in pursuit of a society that will be more concerned about the needs of poor, education and all the many other issues that we face in today’s world. Coming from a union background we are hopeful that he will be particularly sensitive to the problem of unemployment and the needs of working people. 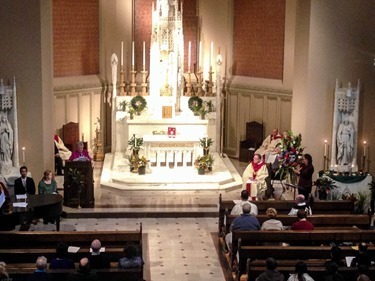 On Monday night I joined the Ethiopian and Eritrean Ge’ez Rite Catholic community that worships at the Cathedral for their celebration of Christmas. The Ge’ez follow the Julian calendar, as do the other Eastern Churches, so they celebrate Christmas on January 7. I was with them during their Mass and, at the end, I held the infant Jesus so they could come and venerate him at the crib. 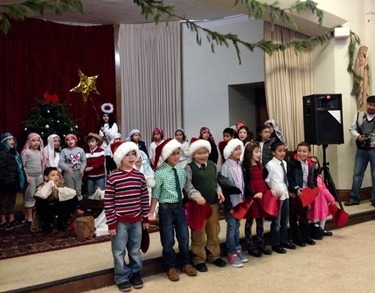 Afterwards, they sang Christmas carols, which may be a little different from those that you are used to. I took this picture of the icon of the Madonna in the sacristy before the Mass. 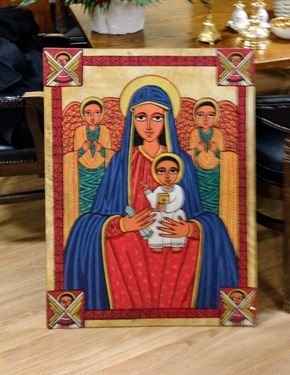 I want to share it with you because it is a typical example of an Ethiopian icon of the Virgin. 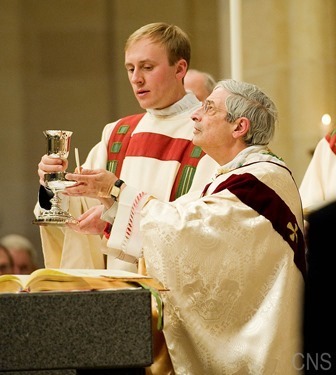 During the Mass they place that in front of the altar.